This Pre-Assembled Gingerbread House Kit is about as easy as it gets. This kit includes a prebaked gingerbread house completely assembled along with all the icing and candies to decorate. There's even a bonus 3-D stackable cookie Christmas Tree. 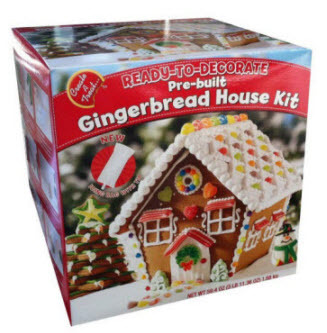 Everything you need to create a beautiful gingerbread house this holiday season... all in an easy, preassembled kit! !!!!!!!!!!!! Last Day to Order This Kit for Christmas Delivery: Friday, December 16th!!!!!!!!!! Please allow 5-8 days for your order to be baked, packed, and shipped. Return Home from pre-assembled gingerbread house kit page.